Checkers Goes To Hollywood: Slo-motion footage of checkers in flight, filmed at 1000fps, is featured in director Spike Jonze film Her. 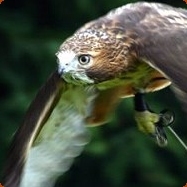 Slo-motion footage of checkers in flight, filmed at 1000fps, is featured in director Spike Jonze film Her. 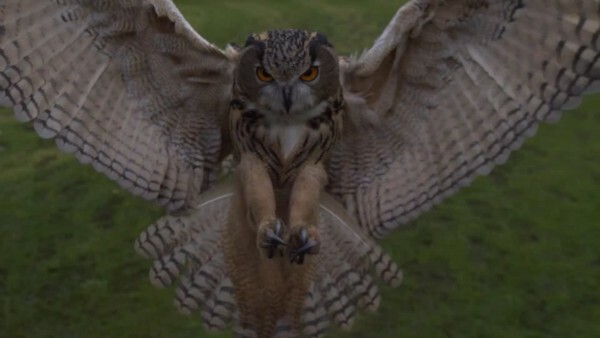 In 2008 Mark Johnson from SlowMo captured Checkers, the European Eagle Owl, in flight at 1000fps using the new Photron SA-2 High definition high speed camera. In 2010, the slo-mo footage was used as part of a Freeview HD ad campaign featuring Rocco Salata. And now, Checkers has made it to Hollywood. The Slo-motion footage of checkers in flight, filmed at 1000fps, is featured in director Spike Jonze film Her. Her (Dir. Spike Jonze; Dir. of Photography Hoyte van Hoytema). There's probably not much of a complex connotation to be applied to the jaw-dropping owl shot in Spike Jonze's Her, short of the obvious message that lovelorn Theodore (Joaquin Phoenix) is caught in the talons of loneliness, heartache, detachment, and familiar modern ennui. But by the time we arrive at this shot, in which Theodore, having roamed a metropolis, sits in front of a giant screen that sees a screech owl slowly grasp for its prey directly behind where Theodore's settled, the emotional, social, and technological wonders of Her's multi-tasking narrative have already dug their claws in. In short, you're in genuine bliss long before this image leaves you awestruck. It's the kind of shot you're simply thankful a director had the generosity to include.